The bronze Trophée des Bicentenaires was made by the Australian sculptor Diana Webber. To celebrate the bi-centenaries of Australia and of the French Revolution, in 1988 and 1989 respectively, the French Rugby Union donated the Trophée des Bicentenaires to be played in perpetuity between the two countries. 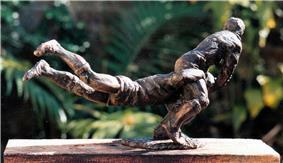 It is a bronze sculpture featuring two players in a tackle. Although the trophy dates from 1988, it was first contested in 1989.